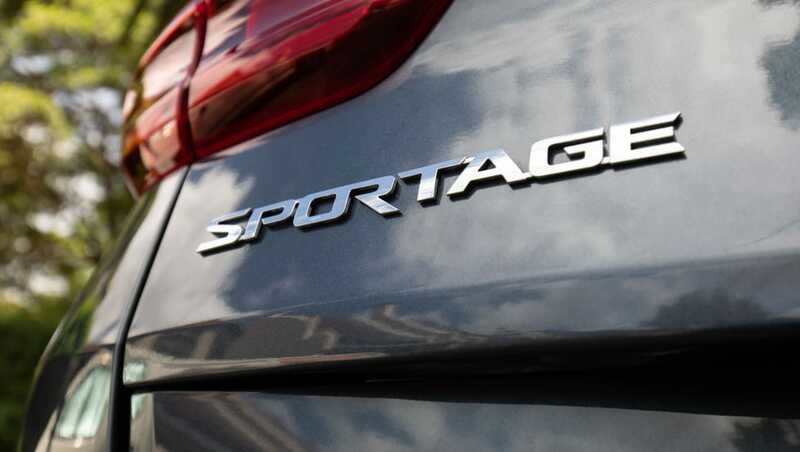 The Kia Sportage sits neatly in the mid-size SUV category, competing against cars like the Mazda CX-5 and Hyundai Tucson. 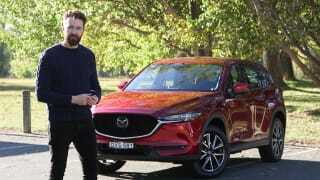 Is it as beautiful as the CX-5? As practical as the Tucson? Where does it sit in the mid-size SUV scale? There are pros and cons to every vehicle, which is why we drive them for seven days - to unearth them all for you. I was driving the Sportage Si which is the bottom of the range and in the AWD diesel, which sells for around $35,500. This week I was throwing an early Christmas picnic with my extended family and we had to bring loads of food, picnic blankets, the kids’ bikes, games and, er us. Did we fit everything in one load? Here's how the Sportage fared over seven days with my (rather large) family. Is it possible for a car to be chubby? I reckon the Sportage is a little chubby. It’s got a boxy shape with curved corners that give it a well-rounded shape. It makes you want to give it a cuddle and is what I called the Seth Rogan of cars. Cute like a teddy bear, but not slick like the Mazda CX-5 or sporty like the Tucson, and thankfully more interesting than the Toyota RAV4. It still looks decent and you feel good driving it. 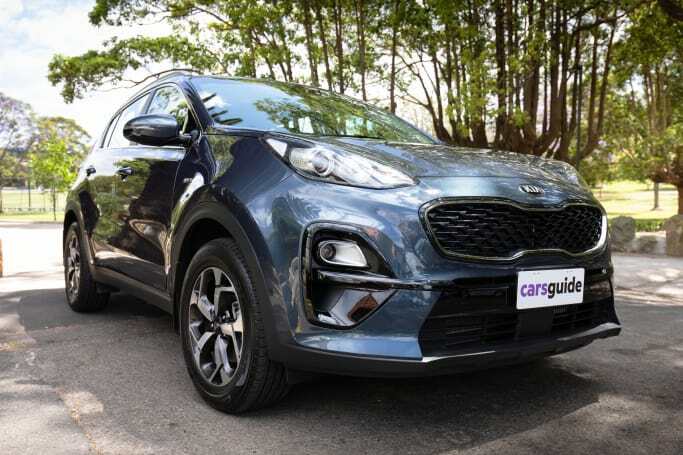 The Sportage has a boxy shape with curved corners that give it a well-rounded look. 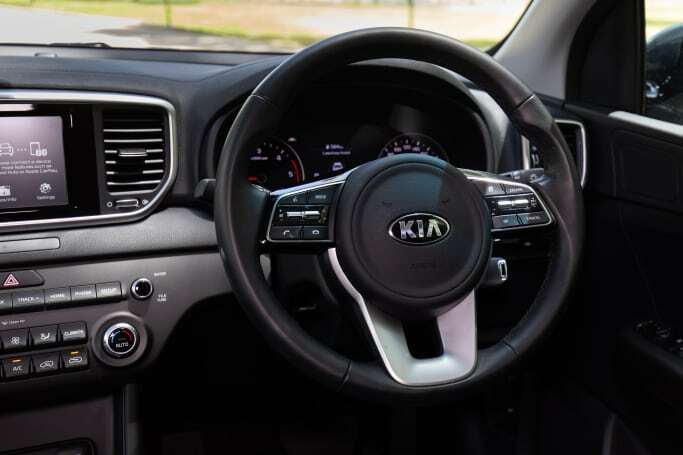 The interiors step it up a notch as Kia has streamlined the centre console area, so there are less buttons and it’s less fussy. 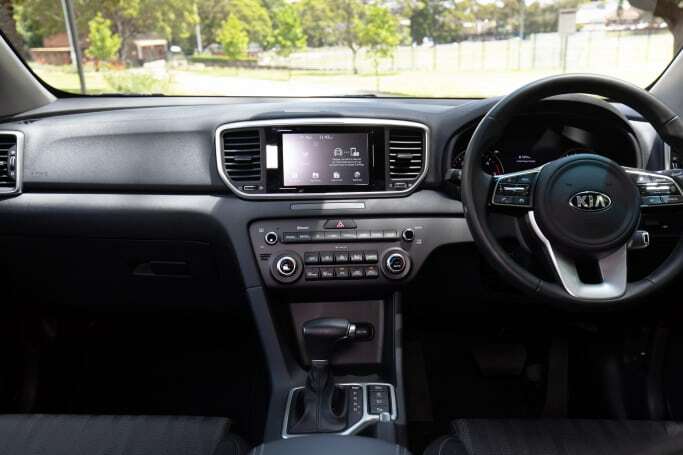 The whole dash and centre area is well designed and even though this is the bottom of the range model, I don’t feel like they have skimped on anything. It certainly doesn’t look like the budget model. In fact, you still get a leather-trimmed steering wheel which feels so nice to touch under the hands, it really lifts the whole driving experience. 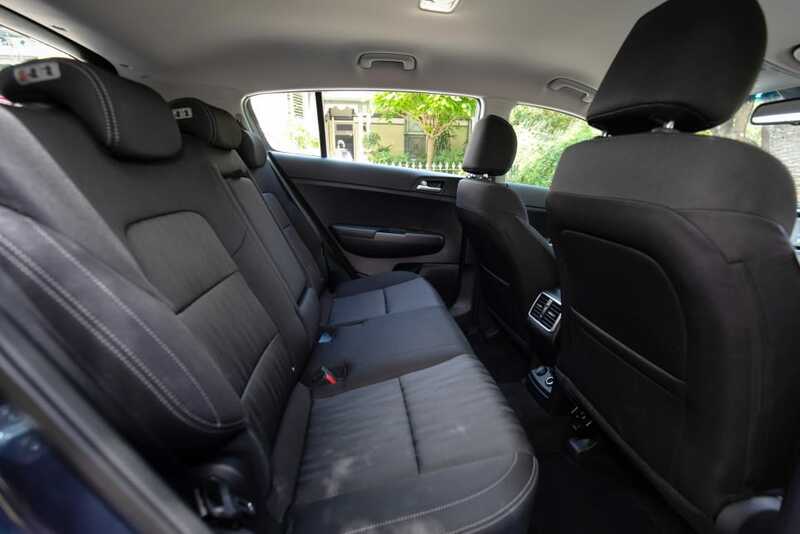 There are fabric seats, but they are comfortable and feel good to sit on and everything is quite tactile, from the soft dash to the volume button on the steering wheel, it all feels good to touch. I was in the diesel model and while that will save you on fuel costs in the long run, it’s an extra $5500 on the initial cost price from the petrol version. I’m not a huge fan of driving a diesel car, the engine is loud whether you’re driving or idling and I also felt this one was a little shaky while idling. 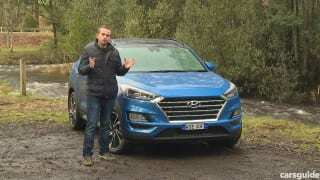 The diesel Sportage Si does come with all-wheel drive (AWD) though, which will give you extra traction on the roads in the rain and also help if you often drive on dirt/gravel/snow. Or just like extra traction like me. The petrol model is two-wheel drive (2WD). So it really comes down to personal preference. The steering wheel turns nice and easily, and you feel confident that it can handle itself well on an open road. Once you get going, the drive is smooth and uncomplicated. It has a 2.0-litre engine which makes it zip up hills and speed up when you need it to. It has good handling, the steering wheel turns nice and easily, and you feel confident that it can handle itself well on an open road. Parking was fine because of the easy turn on the steering wheel, and there’s also a high-def reverse parking camera to help you out. The turning circle is reasonable for a car this size, at 11.0m you’ll be able to fit in some U-turns if you’re trying to nab that ever-elusive park on the school run. The front had lots of room, even my 185cm husband had a good amount of leg and head space, and there was a light breezy feel in the cabin. My two children aged five and seven had loads of room in the back, enough to climb over one another into their favourite seats. You can also fit a third car seat in. I did it with a baby capsule and two boosters, however it’s not ideal. There's a light breezy feel to the cabin. My two children aged five and seven had loads of room in the back. If you have a third child who’s not in a car seat, they will easily fit. Doing seat belts up with three kids in the child seats every day would be really hard work. If you have a third child who’s not in a car seat, they will easily fit though, and we drove to our picnic with the kids’ favourite cousin occupying the middle spot. Tall teenagers and adults will also have enough room to sit in the back even behind a tall person driving. The boot is a decent size. At 466L it’s not the biggest in its class but it beats the CX-5. 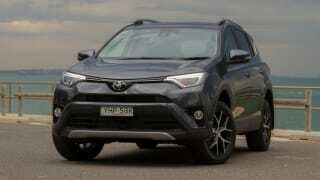 However the Tucson, the RAV4, and the Honda CR-V all have bigger boots. Still, there is heaps of room to fit a pram, and for the picnic we were able to fit two small children’s bikes, two scooters, picnic blankets and rugs but all of our picnic food had to go in the actual cabin. The base model misses out on a push-start button and electric park brake, but I quite like the old-school manual key start and pull up park brake. It means I always know where my keys are (I have spent far too long in cars searching for the keys!) and I also know whether the park brake is on or off. Simple is sometimes best. There are two cupholders in the front, one small and one big, plus a spot to place your phone in and a decent sized centre storage bin. The back also gets two cupholders in the armrest and you’ll find a bottle holder in each door. There are automatic wipers, though the driver and passenger seats are manually put into position which can get a little tiresome, especially if you swap drivers often. The Sportage has Apple CarPlay and Android Auto across the range which is great. Plug in your phone for instant connection to the multimedia screen and access to main apps like maps and Spotify. You can use voice control to send/listen to text messages and make phone calls through the car's multimedia system. Through this you can also use voice control to send/listen to text messages and make phone calls, it’s pretty great. The sound system is also good so don’t be afraid to turn the volume up. The Sportage comes with airbags for driver and front passenger plus side curtain airbags which cover the windows in front and back row. 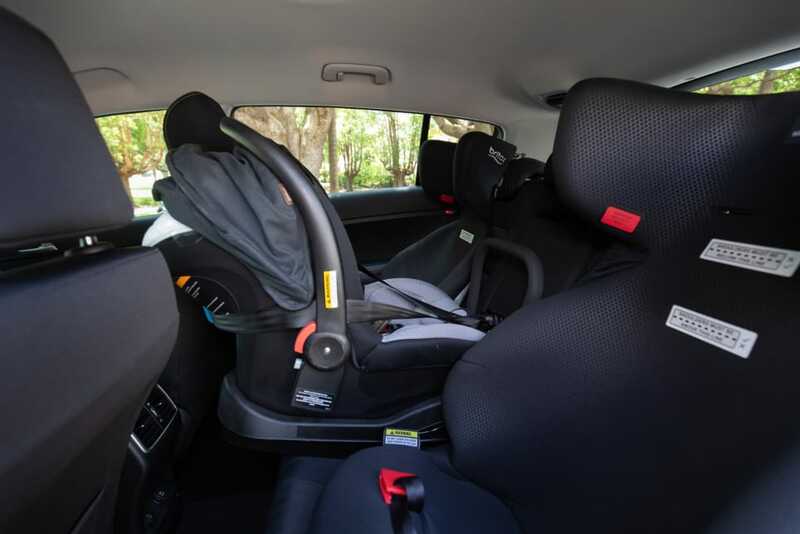 There are two ISOFIX points and three top tethers for children’s car seats. In this base model you will find AEB (auto emergency braking) which is great in this category, but you will have to go up a few models for other new safety tech like rear cross traffic alert and blind spot monitoring. You will get lane keep assist though. The Sportage gets a maximum five-star ANCAP rating. The Kia Sportage Si in diesel costs $35,500. Fuel consumption is a low 6.4L/100km. 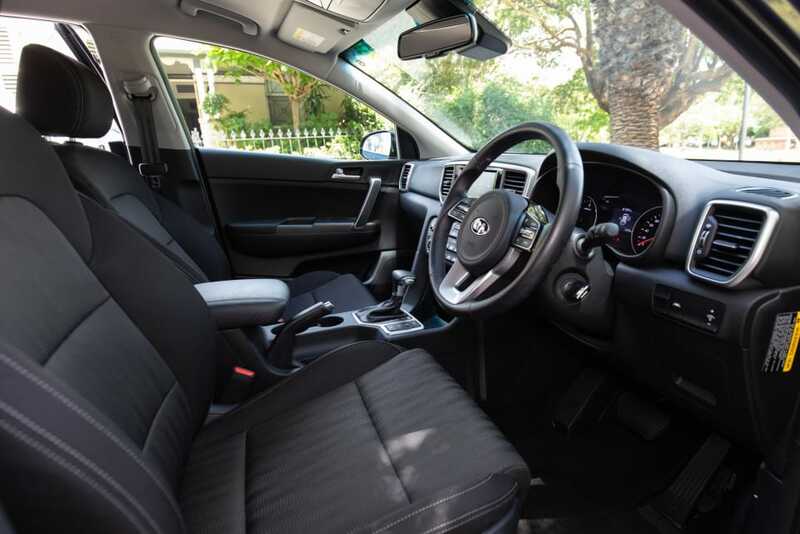 It’s covered by Kia's excellent seven year/unlimited km warranty which includes roadside assist and it's fully transferable which is good news for resale value. The Kia Sportage Si was a pretty good family car for the week. It fit everyone comfortably, had just enough boot space and it drove well, plus there’s the option of 2WD and AWD. I gave it a family rating of eight out of 10 – I think the leather steering wheel earned it an extra half point. My children also gave it an eight, they liked their cousin fitting in the back seat with them.